When Linette Martin, a student at Oxford University, asked her art history tutor if there were any good books on icons for the ordinary reader, he replied that there were books by Orthodox theologians from an theological perspective and books by art history professors from an art history perspective, but nothing for the ordinary reader. Martin, herself an Anglican, set out to fill the gap by writing Sacred Doorways: A Beginner's Guide to Icons. Martin explains that she was initially captivated by the beauty and mystery of icons, but did not understand their "language." Her goal for Sacred Doorways was to write their alphabet, thereby helping others to understand this ancient Byzantine art form. Icons, Martin explains, are meant to convey Christian truths in a visual form, as a complement to the written Bible. Sacred Doorways is an ideal book for the Orthodox to pass along to their non-Orthodox friends. For Catholics and Protestants, it will serve as a non-technical, yet comprehensive introduction to help to increase understanding and appreciation of Orthodox spirituality. 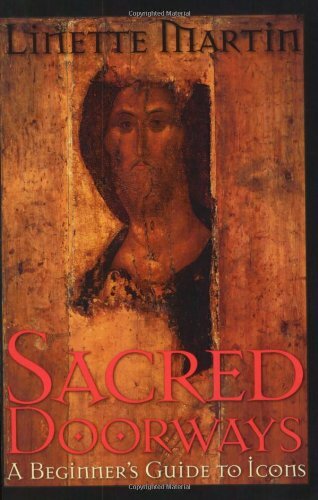 For the general reader, Sacred Doorways provides an essential guidebook to one of the most ancient religious art forms in the world. About Linette Martin (Author) : Linette Martin is a published author. A published credit of Linette Martin is Sacred Doorways: A Beginner's Guide to Icons.